I've been carrying on an infatuation with a coffee cup for what seems like forever... it's so perfect, so very, very asymmetrically perfect. It's by Iittala from the Ego line, and I can't get my mind off it. 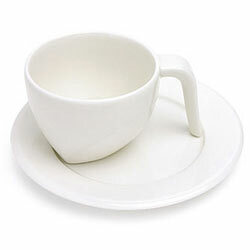 Pristine white porcelain designed by Stefan Lindfors of Finland, it has this lovely off center stance, balanced by a wideset handle that touches down lightly on the saucer. I could write it a poem, I love it so. There's a stunning photo of it here (all gorgeously lit and romantic): http://www.flickr.com/photos/terytky/2385154789/. I open my coffee cup cabinet, see my mismatched mugs and envision a pristine row of Iittala Ego coffee cups and saucers in their place. Poor chipped, wrong sized, rotten old mugs haven't got a chance of ever holding my affection when there's a cup like the Ego in the world. Only trouble is, good grief, they're spendy. $40 for one cup and saucer. One. My love remains unrequited. When is your birthday? Have a birthday party for your friends and ONLY ask for a cup and saucer. You'll end up with the whole set!